Looking for appliance rental? Look no further! Specializing in the apartment industry, Appliance Warehouse of America has become the largest appliance rental source for washers and dryers in apartment homes, condominiums and single-family homes. When you consider all the costs of owning your own washers and dryers it is easy to see why full service laundry rental and appliance rental leasing makes good sense. 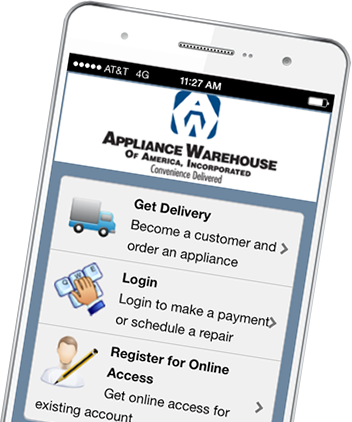 To meet your laundry rental needs, Appliance Warehouse of America provides month to month in-home appliance rentals, with convenient ordering, delivery and removal of your rental appliance, and full service and maintenance during your home appliance rental. If you are an apartment community with appliance rental needs call us today at 800-693-4343 for a customized program. If you are an individual looking for a home appliance rental, please call or click above to order your washer and dryer today.